I’m riding Bike MS Colorado as part of Team Left Hand again this year. We’ll do 100 miles from Denver to Fort Collins, finishing over the Horsetooth Reservoir dam. The next day, we’ll do 76 miles to return to Denver. I’d appreciate your support – even just $5 would be awesome. Donate here. At Canonical, we’ve been doing work to make sure Ubuntu OpenStack deploys on ARM servers as easily as on x86. Whether you have Qualcomm 2400 REP boards, Cavium ThunderX boards, HiSilicon D05 boards, or other Ubuntu Certified server hardware, you can go from bare metal to a working OpenStack in minutes! The following tutorial will walk you through building a simple Ubuntu OpenStack setup, highlighting any ARM-specific caveats along the way. Note: very little here is actually ARM specific – you could just as easily follow this to setup an x86 OpenStack. 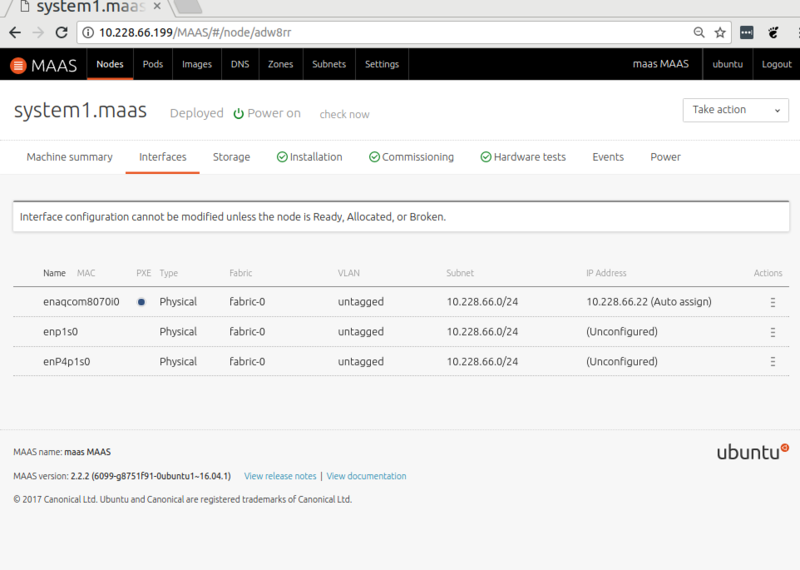 Ubuntu OpenStack is deployed using MAAS and Juju. If you’re unfamiliar with these tools, let me give you a quick overview. 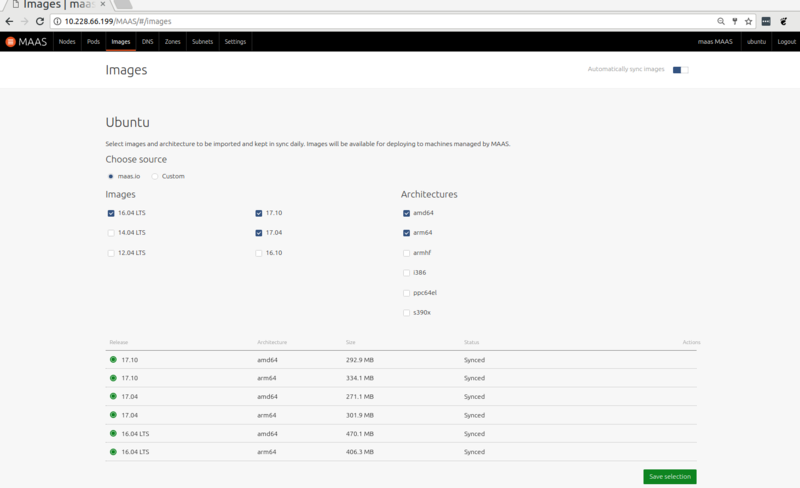 MAAS is a service that manages clusters of bare-metal servers in a manner similar to cloud instances. Using the web interface, or its API, you can ask MAAS to power on one or more servers and deploy an OS to them, ready for login. 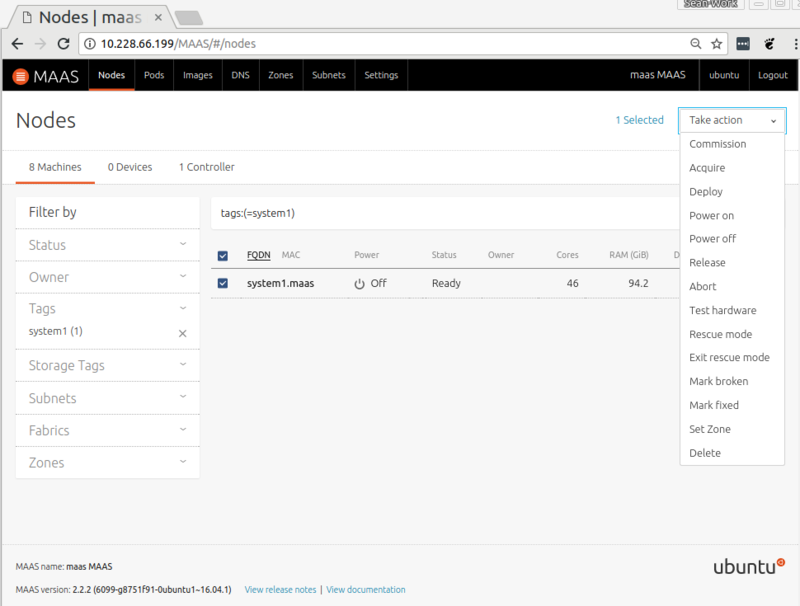 In this tutorial, we’ll be adding your ARM servers to a MAAS cluster, so that Juju can deploy and manage them via the MAAS API. Juju is a workload orchestration tool. It takes definitions of workloads, called bundles, and realizes them in a given cloud environment. In this case, we’ll be deploying Ubuntu’s openstack-base bundle to your MAAS cloud environment. 5 ARM server nodes for your MAAS cluster. 4 of these will be used to run OpenStack services, the 5th will operate a Juju controller that manages the deployment. Each system needs to have 2 disks (the second is for ceph storage). Each system needs to have 2 network adapters. To keep this simple, it’s best if the network adapters are identically configured (same NICs, and if plug-in NICs are used, same slots). Install this server with Ubuntu Server 16.04. A clean “Basic” installation is recommended. >= 10GB of free disk space. 1 client system for you to use to execute juju and openstack client commands to initiate, monitor and test out the deployment. Make sure this is a system that can run a web browser, so you can use it to view the Juju, MAAS and OpenStack GUIs. Ubuntu 16.04 is recommended (that’s what we tested with). We’re using a 10.228.66.0/24 network throughout this tutorial. MAAS will provide a DHCP server for this subnet, so be sure to deactivate any other DHCP servers to avoid interference. 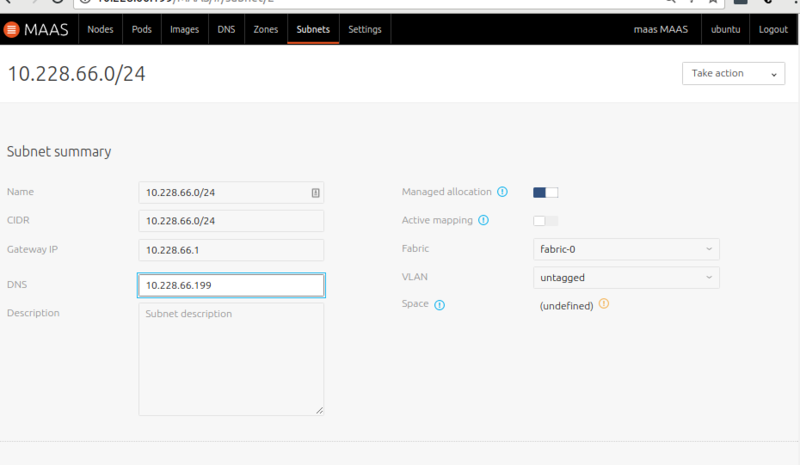 10.228.66.21:10.228.66.50: MAAS node IP pool (IPs MAAS is allowed to assign to your ARM Server nodes). OK. Let’s get to it. Login with the admin credentials you just created. Select arm64 in Architectures of image sources and click “Update Selection”. Wait for image download and sync. After all images are synced, Click “Continue”. Click on the Node name, and select “Commission” in the “Take action” menu. This will begin a system inventory process after which the node’s status will become “Ready”. Repeat for all other nodes. Before we deploy OpenStack, it’d be good to first demonstrate that your MAAS cluster is functioning properly. All good? 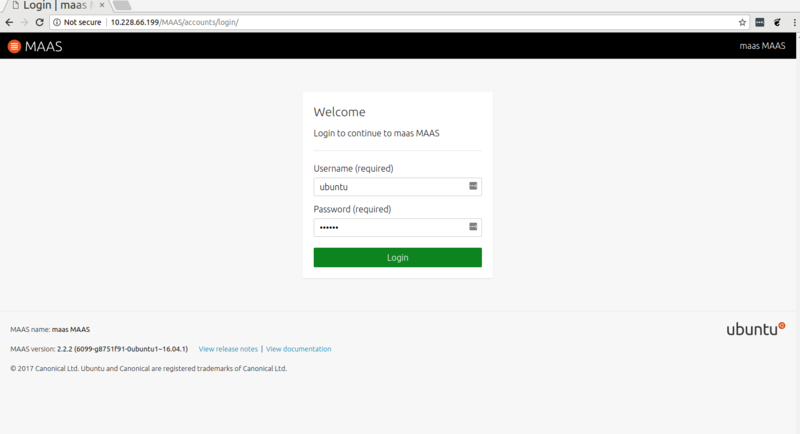 OK – release the node back to the cluster via the MAAS UI, and let’s move onto deploying OpenStack! 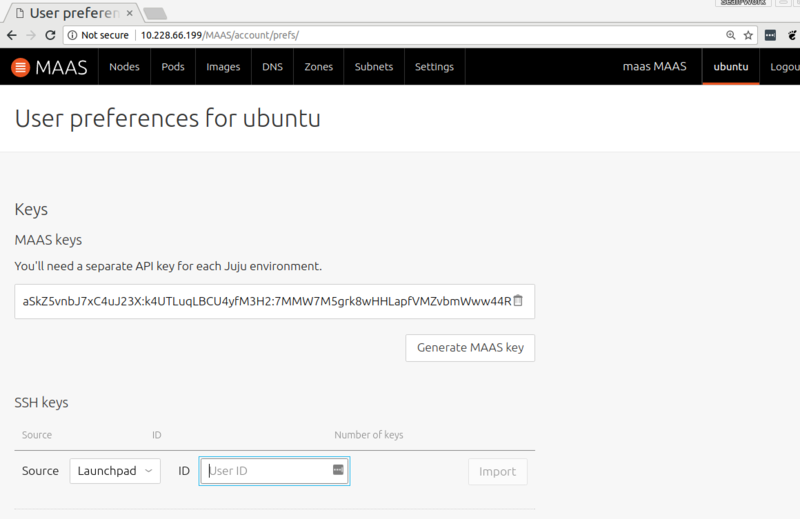 Then, configure Juju to use your MAAS environment, as described here. 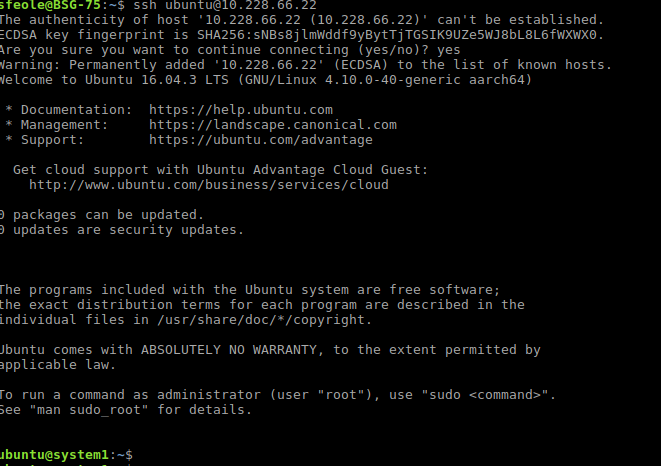 Where “maas-cloud” is the cloud name you asssigned in the “Configure Juju” step. 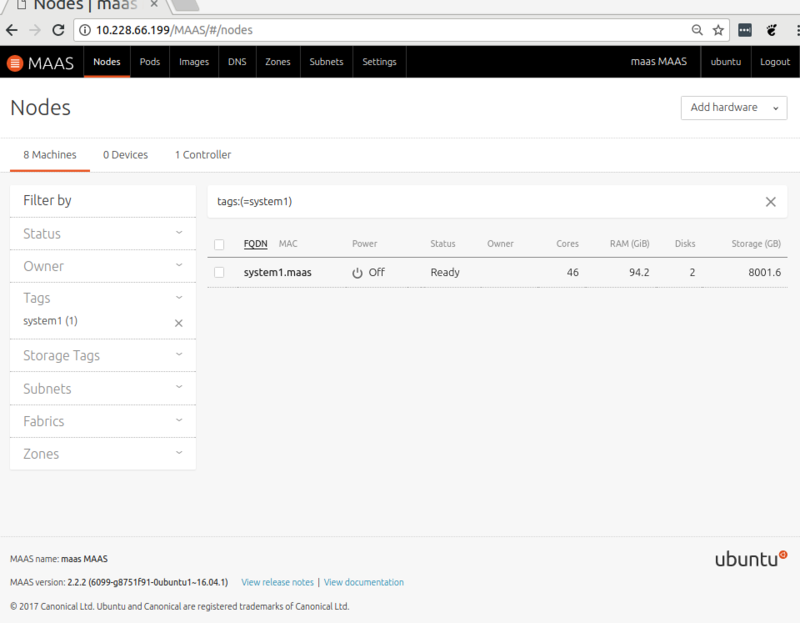 Juju will auto select a node from the MAAS cluster to be the Juju controller, and deploy the node. 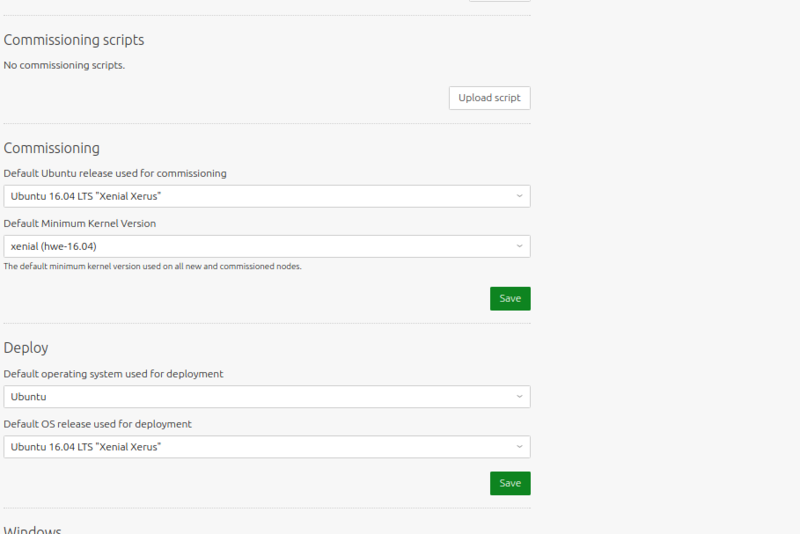 You can monitor this progress via the MAAS web interface and the console of the bootstrap node. Locate the bundle.yaml file from the openstack-base.zip tarball. Open the bundle.yaml file in a text editor, and locate the data-port setting for the neutron-gateway service. Change the data-port setting as appropriate for the systems in your MAAS cluster. 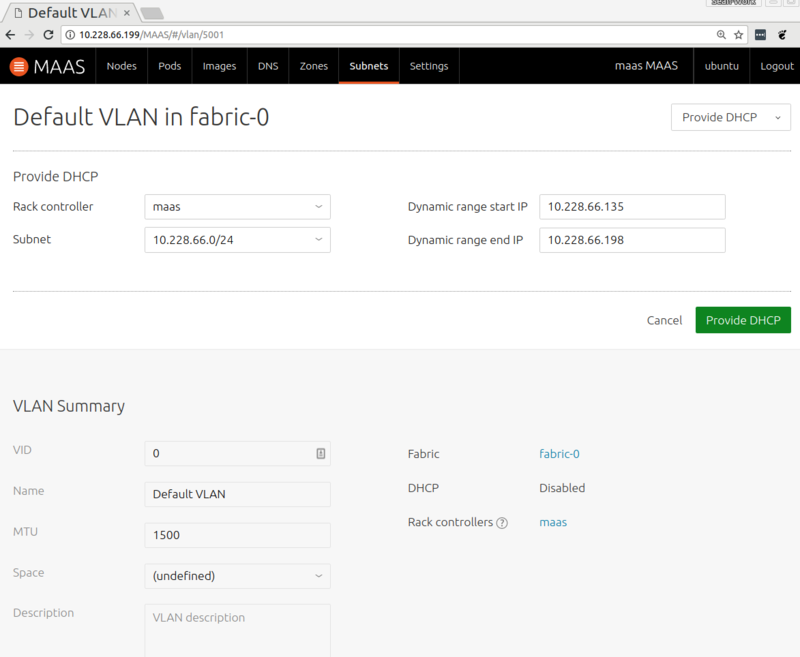 This should be name of the connected NIC interface on your systems that is not configured by MAAS (see the diagram in the “Network Layout” section of this post). For example, if you have a cluster of systems like the one showed on the MAAS interfaces tab screenshot above, you would want to set data-port to either br-ex:enp1s0 or br-ex:enP4p1s0 (enaqcom8070i0 is the one configured by MAAS). 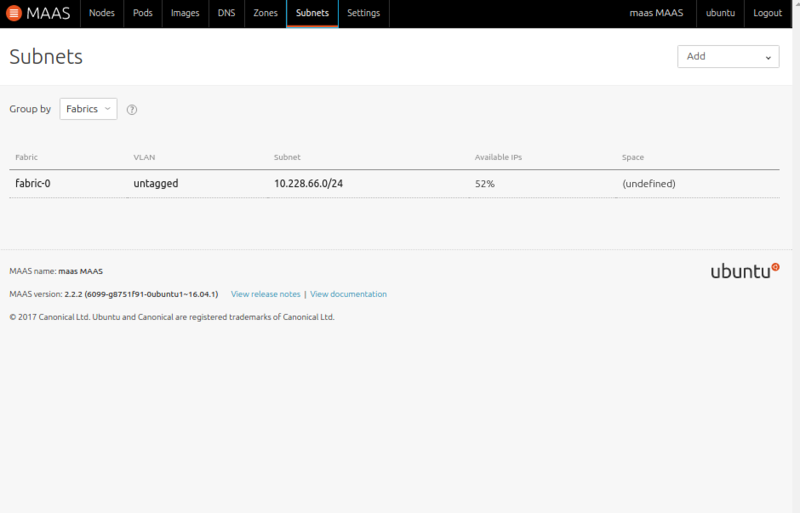 For more information, see the “Port Configuration” section in the neutron-gateway charm docs. Note: The deployment is complete once juju status reports all units, other than ntp, as “Unit is ready”. (The ntp charm has not yet been updated to report status, so ntp units will not report a “Unit is ready” message). (^ This is a fork of the main charm docs w/ some corrections pending merge). Ubuntu 14.04 originally shipped with a 4.4-based kernel, which didn’t yet support booting as a KVM guest on GICv3 systems. This meant you could only boot trusty instances on GICv2-based hosts. However, thanks to our Foundations team, Ubuntu 14.04 (‘trusty’)/arm64 images have switched to using the Ubuntu HWE kernel. This means you can now run Ubuntu 14.04 (‘trusty’) KVM guests on GICv3 ARM64 hosts, such as those based on Cavium ThunderX, HiSilicon Hip07 and Qualcomm Centriq. Ubuntu cloud images are available here. See this page for info on how to boot cloud images directly in QEMU. Note: these images will also just work with the Newton release of OpenStack on Ubuntu – more on that later. I made a new blog. This is it. 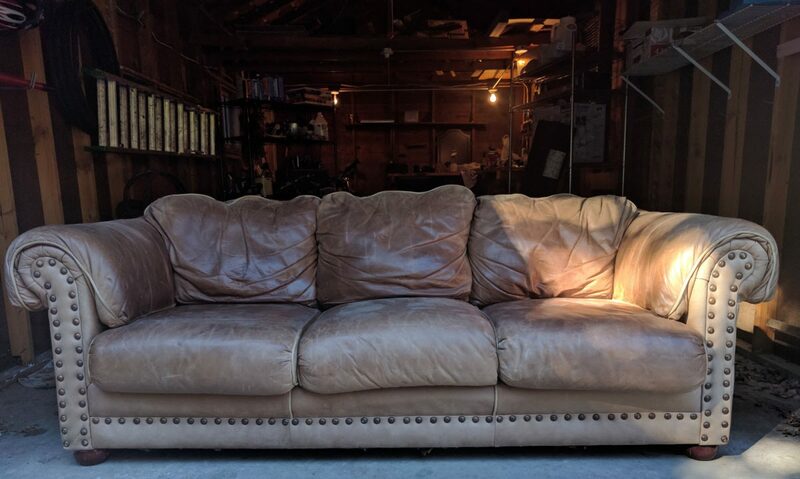 That’s a picture of my old sofa I took for Craig’s list.